If you’ve ever been handed a blank sheet of paper and told to “draw something creative” you know how hard it can be to generate ideas out of thin air. As they say in the design world, innovation is a process, not an event. Without any sort of prompt or direction, the possibilities of that blank page are limitless- you could draw a new solar powered flying car, or an underwater monkey kingdom, or… you get the idea. For some people, this problem is compounded by a fear that the moment they touch their pen to the pristine white page, they are ruining it with their scribbles. During my years as a teacher and summer camp director, I saw the “blank page” problem rise again and again, and not just with art. When children enter a new environment or space, they look for cues that help them figure out where to go/what to do, and the fear of getting this wrong and looking foolish can be paralyzing. For that reason, whenever we set up a classroom we would always pre-set the games, puzzles and blocks on the floor, removing them from boxes and laying them out in an inviting manner. With blocks, we would spread them across the floor and build some half-finished structures that invited kids to add on to them. With murals and artwork, we would always draw several images and lines that showed kids that yes, it was ok to scribble on the paper. The concept that people are more likely to engage with an activity if they feel like it has been started for them was validated in a UCLA Business school study conducted by Professors Joseph C. Nunes and Xavier Drèze. The study looked at two car wash businesses who gave away customer loyalty cards. Car wash #1 gave away a card that required 10 car washes to earn a free wash, but pre-stamped the first two. Car wash #2 gave out a card which required 8 stamps to earn a free car wash, and did not pre-stamp the cards. After tracking the customer redemption rate, the professors found that the cards that had been pre-stamped showed a 34% return rate over a 19% rate from the 8 stamp cards. Although these cards required the exact same number of purchases, the pre-stamped cards gave customers a sense of ‘endowed progress’- the feeling that they were already on the road to achieving their goal, rather than starting from scratch. Person, Place, Problem prompt cards. Even for the best writers, storytelling is frequently a challenge. 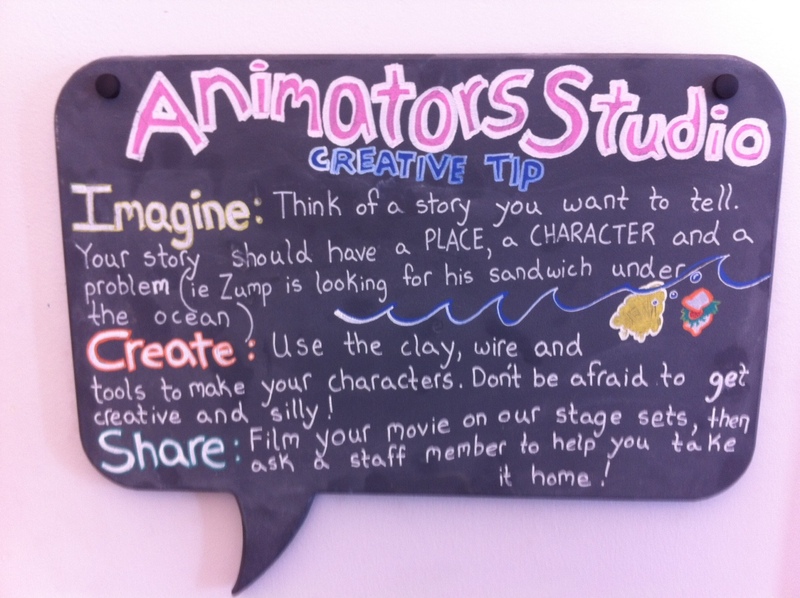 We have observed that families who come to our animation studio often struggle to come up with stories they want to tell. To help get them started, we offer a deck of “Person, Place, problem” cards which they can draw at random to generate a story prompt. Examples might include “A penguin, in outer space, being chased by an evil twin” or “A chicken, under the ocean, looking for his lunch”. Creative Challenges: During our Creative studio workshops, rather then giving participants materials with a totally open ended goal, we typically offer a box of randomized challenges to get them started. Most recently, we ran a Mystery Box challenge that asked kids to draw a random card from a “Challenge Deck”. 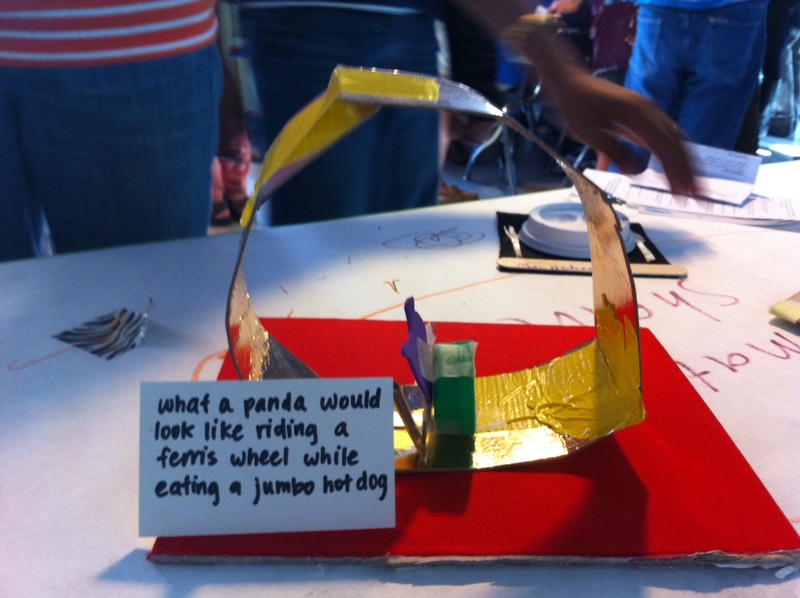 Kids could select an easy, medium or hard challenge, and the cards asked them to create “The world’s fastest race car” or “An amusement park ride from the future” using only the materials we provided in a small box. By constraining the materials as well as giving prompts via the challenge, we typically see a much higher engagement and participation rate. 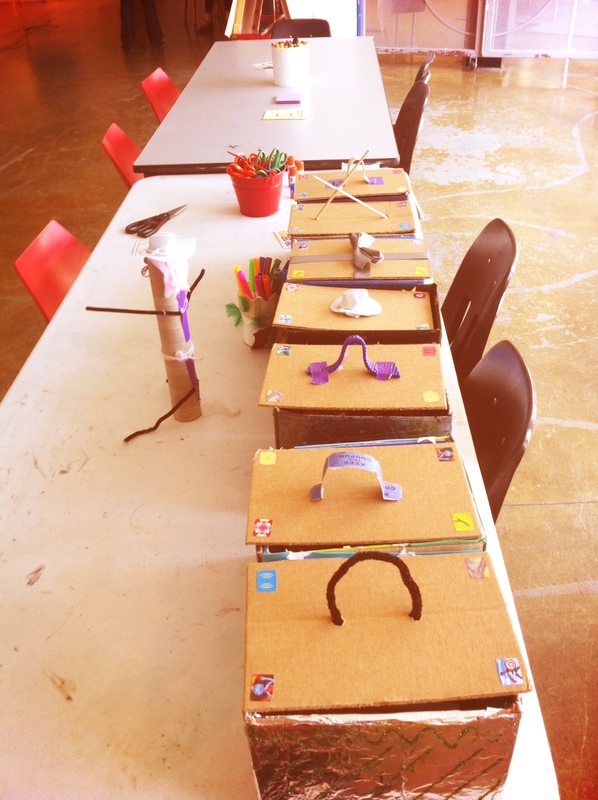 Even more interesting, once kids complete that first challenge, they begin to see themselves as a “Super Designer” and build their creative confidence. (We support this by handing out badges after each challenge with different rankings- Design Agent, Design Ninja, Design Expert). Wander Monster: We have been totally inspired by Pratt Insitute instructor Robb Kimmel, who sends his son to school every day with a ‘Wandermonster’ prompt- the paper includes a half written story and half finished drawing. 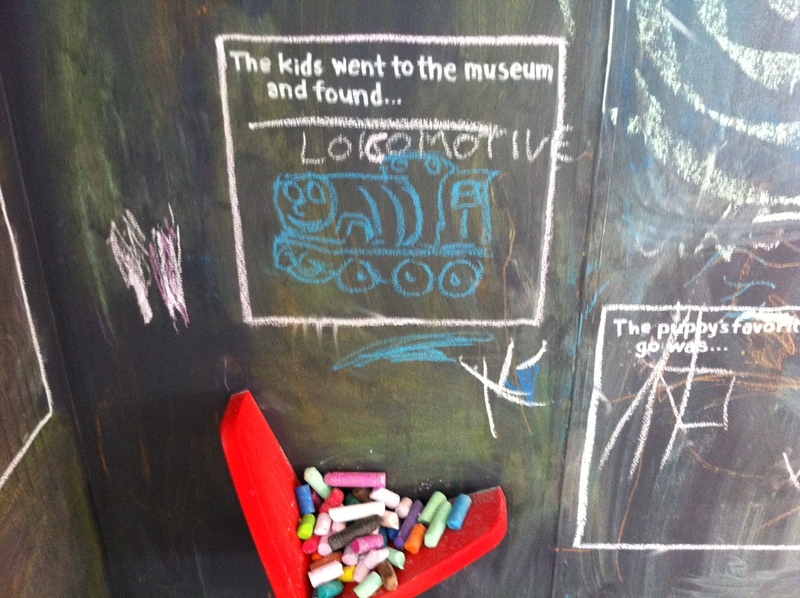 At lunch, his son opens the prompt and completes the text and photo with his own imagination. This is a marvelous example of sparking the imagination through both prompts and a creative challenge, and is a concept that can be applied to a wide range of mediums. At CCM, we have embraced this approach and created similar prompts (Complete a story+ add to the image/code) using Photoshop, Scratch programming, and iStopmotion. We also empower participants by asking them to create their own creative prompt for someone else, thus allowing them to participate as both a designer as well as instructor. By providing these imagination starters, we are not only modeling potential interactions and uses of different media tools, we are also giving kids a launch pad for their creativity. Just as with any form of scaffolding, these prompts are designed to be slowly removed as children start learning to generate their own prompts and challenges. The best part? What we often see is children becoming empowered to create their own challenges to give to peers, developing a “By kids, for kids” community of creative thinkers and doers. Have a great example of an Imagination starter you’ve used? Please share with us! Leave a comment below or email us at Education@Creativity.org with your ideas and we’ll share them in a future post. This summer, we ran a workshop for teachers called “Camp WooHoo” that introduced the growth mindset theory made famous by Carol Dweck. During the workshops, we encouraged teachers to explore their own comfort with taking various types of risks- social, professional, artistic. During the debriefings, many teachers expressed the discomfort they felt when they were pressured to produce a perfectly drawn picture, or to follow instructions perfectly. Others talked about the importance of having time to make mistakes and explore the programs they were working with. As we talked about how these same pressures might be felt by students in a classroom, it became clear that all too often we put these expectations of perfection on activities and assignments. When leading a writers workshop, for example, are you making it clear to students that early drafts are an opportunity to try out different plot ideas and take creative risks? When you introduce a new program or digital tool to students, are you giving them time to play and explore in an open ended fashion before expecting them to complete assignments using those new tools? Woodside Priory, a private secondary school, has made a school wide commitment to “Fail Forward Fridays” once a month, where teachers, students and administrators try out new curriculum, furniture arrangements or lesson plans. Just as valuable as the experiments themselves are the debrief discussions and lessons learned that emerge from these days- we would argue that there is a key distinction between merely failing and ‘failing forward’. Share your strategies for encouraging risk taking and failing forward in the comments below, then check out these amazing videos of creative legends discussing failure. A paperclip or a robot’s fingernail? In honor of the new school year, we thought we’d offer a tip to spark some creativity in the classroom. Are you trying to figure out what topics to study, what books to read, or what projects to give your class? Instead of giving the topics, why not let them decide themselves with a brainstorming session? Start with a prompt such as “If you could only study one thing for a year, what would it be”, “What are you an expert at”, or “What would you like to be an expert at”. No criticism or debate. Make sure students know that NO idea is a BAD idea and all ideas should be respected. Even if a student thinks it is ridiculous or impossible, it goes on the list. Emphasize quantity over quality. The goal is to have as many ideas as possible. Wild and crazy ideas are encouraged. Encourage students to build off of others ideas. Copying is OKAY in a brainstorming session. This is a team activity and everyone should participate. If you feel that they might be hesitant at first, start with a warm-up brainstorming session, something that’s fun and crazy, to get students used to the possible excitement in a brainstorm. Find an item in your classroom and prompt the students with something like “100 uses for a paper clip”. You might get answers such as “holding paper together”, but participate with some crazy ideas like a robot fingernail or an ant maze.